"You have a thing for it" a friend of mine mentioned this during one of those tension filled conversations I had with him before my sessional exams this week, well he was nice and generous enough to boost me up. And I took it very seriously, better late than never or so we all have been taught and I thought. I was speeding at twenty two knots after that with my reading, more so messing up with my textbooks and notes in all the time I could get amidst all the lab and thesis work.This does not qualify as an excuse or a complaint, the important clause of the current status of my life being my post graduation.What remains as a question is how well I have fared, and I bet whoever reads the kind of stuff I have written will go back and read Kuby's for all the immunology I have discovered and created this time in my answer sheet. 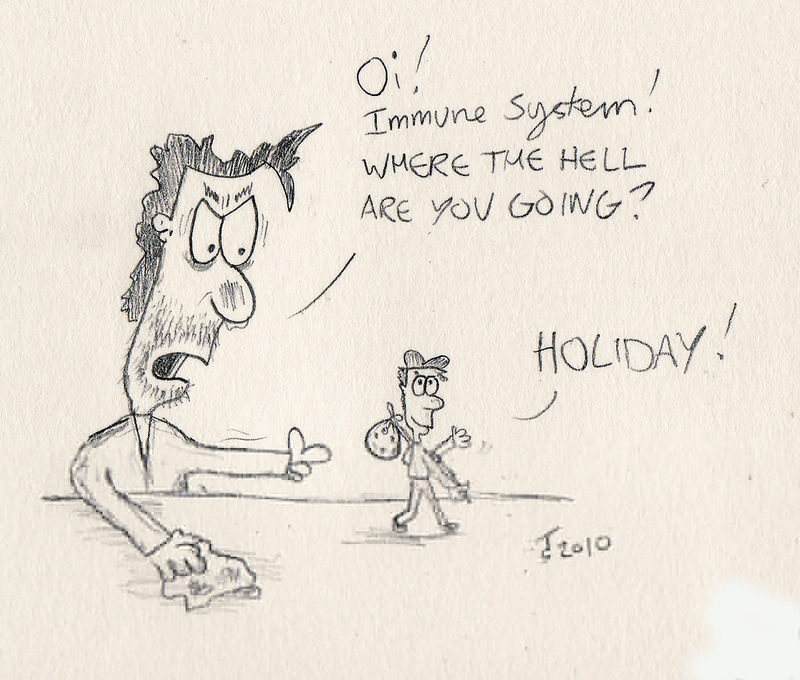 Immunity is complex, literally. I realized this while trying to understand its basic concepts. It reminds me of the absurd things that I am allergic to- mosquito bites, cucumbers, eggs, lemons, detergents and pollen. You name it I have it. Some self proclaimed allergens like bananas and lack of time sense in fact top my list. I was a difficult kid because of all this, my folks know this well. Those wheezing and dyspnoeic attacks with every change in the weather, how my mother turned into my pillow during those nights, how my father ran behind me for that one dose of syrup all throughout the day and that blue inhaler in my school bag are some strongly immunogenic things ingrained in my memory cells. Thank God, I am more immune now. I practically had a thing for it, a difficult one that too, and that is one of the reasons I have to understand what infection and immunity is all about. We are more gifted than we actually know when it comes to health, not many appreciate this fact and not many get a chance to learn everything about it. I have 'Immunology' to deal with. Fascinating... to read about this. I personally have developed a deep regard for microbiologists. Those micro-organisms can cause a ruckus in our body!